Last year, I was thrilled to be a World Book Night Giver, which meant that I was sent copies of The Book Thief to hand out for free to people in town, in an effort to help spread the love of reading. It was an amazing experience, and one that I hope to repeat again this year. 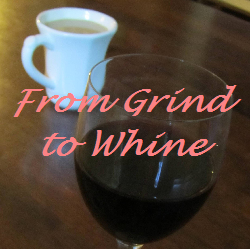 So many friends and readers of this blog asked me how they could get involved. As promised then, I’m now happy to share that information with all of you. 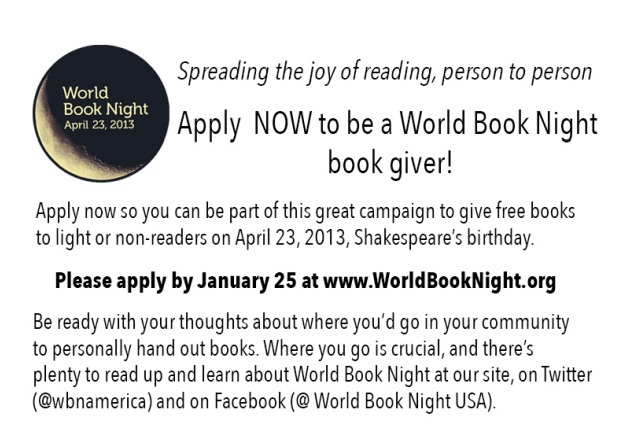 If you would like to submit an application to become a World Book Night Giver, please visit the World Book Night website using this link for the application form and guidelines. Browse through the 2013 List of WBN Titles to familiarize yourself with your choices. You will be asked to choose 3 that you would be interested in giving away. Based on your location and the number of books available, they will match up 20 copies of one title to each giver. Last year, I wrote this post on 6 Benefits of Reading for Yourself, which I handed out with the books. Many other WBN givers asked if they could do the same. It seemed a good match, as we all try our best to reach light or non-readers and encourage them to share our love of the written word. If you are interested in being a WBN giver, be sure to submit your application by this Friday to be considered. Good luck and happy reading!